There is a very small $10 registration to cover cost of organizing, my meetup organizer fees and cost of musicians. They travel all the way just for this Kirtan and your small donation ( cost of 2 coffees !) would help them and me ! 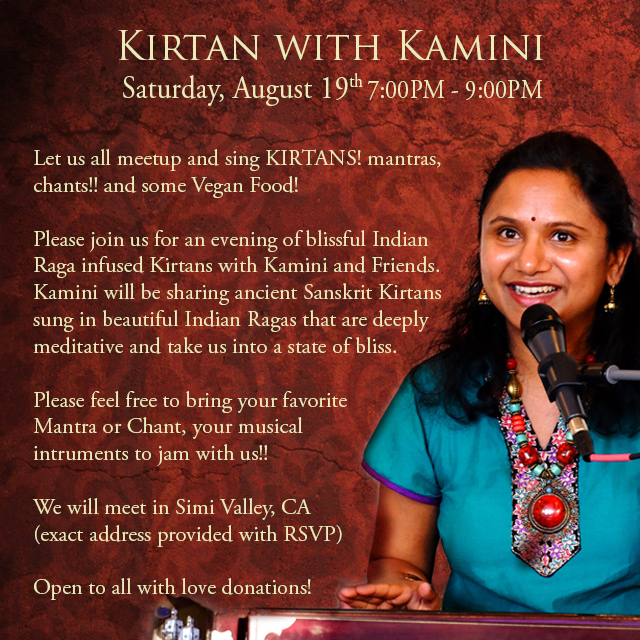 Lets meet, chant, meditate and Sing Kirtans with some delicious Vegan food !! I will be sharing authentic traditional Sanskrit Kirtans infused with Indian Ragas. Indian classical music and its ancient tradition of Ragas (sacred scales) is a classical mode for practicing Kirtans. While meditating on the tones in different ragas, amazing transformations can happen. Kirtans have short “Mantras” or couplets. These mantras are repeated over and over. Typically the lead singer starts singing the Mantra slowly and builds in up to a higher tempo. By focusing on the rhythm and by singing these versus people experience freedom from stress. Often times people who participate, clap in rhythm while singing, close their eyes to concentrate and at the end of a Mantra sigh and enjoy the newly found bliss and enjoy the silence. Kirtan involves singing but it goes beyond ones singing abilities. It is not about the “Art” of singing but about “Heart” of singing. Everyone can participate, regardless of age or cultural background. The purpose of this music is to get us out of our heads and into our hearts. Typically, the songs can last for 20-30 minutes each with a few moments of silence in between each song so you can soak it all up. The longer songs allow for deeper experience of the effects, and with the simple, repetitive lyrics (it’s a chant, after all!) we really don’t have to think much about the words.People often say they feel “buzzed” for days following such a chanting experience.